Children play with doors all day but if there is one door you want them away from, it’s the garage door. This door can cause horrific injuries or even death if it is not child proofed. Although there is no perfect method to keep things from hurting the little ones, we have compiled a few things, which when adhered to, can reduce the chances of a garage door accident involving kids. The reverse mechanism is a technology that opens the door when it comes in contact with anything solid before it locks into place. 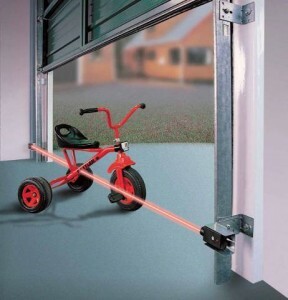 The mechanism is a must-have for all garage doors according to the law. Now, if the photoelectric sensor that controls the reversing is not working, a garage door can come down on your child with tragic consequences. To avoid this, regularly check whether the door is reversing if it comes in contact with a small wood plank, for example. Some people remember to check the reverse movement and forget to adjust the force at which the door reverses. Ideally, the slightest opposition before full closure should trigger the reverse mechanism. This way, if the door ever came in contact with a toddler, it would not press down rather it would reverse. Check to ensure that you door reverses when it encounters a relatively low resistance. Placing the door controls high prevents kids from reaching the switch and playing with the door. When kids are closing and opening the door for fun, they are likely to cause damage to the motors, which run the door. As a result, the door may jam and come down on them since there is no motor to control the reversing. The electrical cables to the garage door switch should always be inspected because any exposure can lead to untold damage. The equipment kept in the garage may accidentally expose the wiring and a child may touch a live wire. To prevent this, it is recommended that you regularly check for any exposed cables, especially near the switch. If you live in an area that gets hit by storms regularly, the best thing to do after a storm is keep the garage completely out of bounds for kids. This is because storms cause a lot of damage and the door may have taken a beating, making it unstable and therefore unsafe for children. The garage should only be used after it has been inspected and everything found to be in good working condition. Additionally, if your children store their playthings in the garage, make sure that they understand that the garage door is not to be played with. In some families, kids are only allowed to access the garage through a door from inside the house and never by the main garage door. These and other small precautions can be the difference between a healthy kid and a funeral home.